YDA President Rod Synder addresses Providence attendees. The future of the Democratic Party was front and center at the RI Convention Center on Saturday as the Young Democrats of America (YDA) came to town to hold their New England regional conference. Nearly 50 attendees from New York to Maine met for day of talks, panels, and business (including the election of their new Regional Director, Dustin Hausner) and the rising stars of Rhode Island politics were well represented. The Convention Center was packed — with dancers attending the "Jump Dance Workshop" at the sold-out Providence stop on its multi-city tour. The hundreds of teens and pre-teens padding around the convention halls with dance bags and costumes and their booming performance music provided a oddly fitting complement to the proceedings of the young Democrats assembled in a function room on the 5th floor. Providence Mayor Angel Taveras welcomed attendees, described his own political journey, and spoke frankly about the challenges of leading a city through a difficult financial crisis. "I didn't want the first Latino mayor of Providence to be the one who brought the city into bankruptcy." He credited taxpayers and unions alike for being willing to pitch in, and stressed the importance of "being straight and open" and "negotiating in good faith" in bringing everyone to the table. Taveras urged attendees to rise to the challenges of activism and governance. "You have to stay involved and believe you can achieve. Don't let negativity and cynicism get in the way," he said. "Remember, we can change the world." That was a theme was echoed by afternoon keynote speaker Rod Snyder, the national YDA President (reportedly contemplating a run for congress in West Virginia at the end of his second term this summer). "Rarely has there been a time," said Synder, "When young people have more opportunity for impact." With a quarter of the US voting population under 35, Synder said, Millennials have come to rival seniors as a key electoral bloc, and their values are most aligned with the Democratic party. 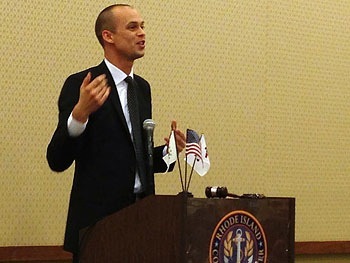 He singled out the Rhode Island attendees for their significant role in passing marriage equality. "YDA is not just riding the wave of the youth movement," Snyder said, "We're leading it." Another highlight of the afternoon was a panel of young elected officials, moderated by outgoing RI Democratic Party chair (and Secretary of State candidate) Ed Pacheco. In addition to Maine's Justin Chenette (at 22, the youngest openly gay legislator in the US), the panel featured RI State Sen. Adam Satchell (D-9), Rep. Katherine Kazarian (D-63), Central Falls Mayor James Diossa, and Smithfield Councilor Suzy Alba, who all offered advice for young Dem candidates. "Don't wait, If you sit around, bad stuff happens." said Satchell, adding, "Don't back down." Said Kazarian, "Stay active, and get your friends involved." Alba, who credited her win to knocking on 4,000 doors, suggested that acknowledging diversity helps. "I was very open about my differences," she said, adding that she found voters responded. Diossa talked about the importance of understanding why you're running. "If you don't believe what you're doing, it's hard to communicate it to the people around you." Chenette suggested turning age from a potential liability to an asset. "We're not beaten down by the system," he said, "People recognize your passion." That was a theme picked up by moderator Pacheco (who, at 31, is still 4 years under the YDA cutoff for "young"). "Many people underestimate us because we're not 55, not an attorney, and haven't been in public office for 20 years," he said. "But we all have something to contribute." Pacheco, who has announced his intention to run for Secretary of State, talked about the importance of engaging younger voters. "My goal would be to reach out to every young person and invite them to be a part of the process," he said. "The window can not be half open." There were two other panel discussions — one on the policy issues facing young people and another on grassroots organizing, featuring some of our state's most engaged young activists from organizations like MERI, Planned Parenthood, Providence Student Union, and RIPayDay.org (and, of course, the Young Democrats of RI). The day wrapped up with the official business of the conference, electing regional officers. Dustin Hausner, of New York, was unanimously elected to be regional director for the next two years. "The Northeast has always been a region of hope and progressivism," said Hausner, thanking the attendees, "I'm excited to be working with all of you." Jonathan Sclarsic of Massachusetts was elected deputy region director, and New Hampshire's Douglas Lindner secretary-treasurer. Additional pix up on Flickr. Editorial note: Crossposted at RI Future. Update: Corrected spelling of Rep. Kazarian.